Paolo Gabriele, Pope Benedict’s former butler, found guilty of stealing papal documents, has been moved to a Vatican cell to serve the rest of his sentence. Paolo Gabriele was given an 18-month prison sentence earlier this month. He admitted passing documents to a journalist, but said he did it out of love for the Church and the Pope. The Vatican secretary of state’s office has left open the possibility of a papal pardon if Paolo Gabriele repents and seeks forgiveness. As neither Paolo Gabriele’s defence lawyer, nor the Vatican prosecutor, has entered an appeal, his sentence has now become definitive. Paolo Gabriele will serve his prison term in a special detention room inside the Vatican police station. The Vatican authorities were worried that if he were to be moved into an Italian prison he might be subject to pressure to reveal secrets which might cause further embarrassment to the Pope. The Vatican has dismissed suspicions of a wider plot, saying that Paolo Gabriele acted alone in obtaining the documents and giving them to an Italian journalist who published them. The trial of his co-defendant, Claudio Sciarpelletti, is due to start in early November. 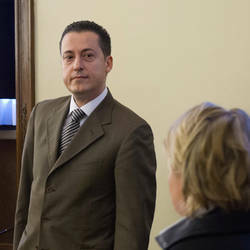 The computer expert is accused of helping Paolo Gabriele while working as in the Vatican’s Secretariat of State. Paolo Gabriele’s trial heard that he had used the photocopier in his shared office next to the Pope’s library to copy thousands of documents, taking advantage of his unrivalled access to the pontiff. He later passed some of the documents to journalist Gianluigi Nuzzi, who released a best-selling book about corruption, scandals and infighting at the Vatican, largely based on the confidential papers. Its publication sparked the hunt for the source of the leaks inside the Vatican. Paolo Gabriele confessed to taking the papers, but said he believed the Pope was being manipulated and hoped to reveal alleged corruption at the Vatican.